As these stock hybrids increase the importance of a shareholder in the company, investors are focusing more on preferred shares to get better returns on their investments. With the market changing its course every day, more and more investors are buying preferred stocks rather than investing in low-yield government bonds. As these stock hybrids increase the importance of a shareholder in the company, investors are focusing more on preferred shares to get better returns on their investments. Preferred shares are a kind of shares that entitle a shareholder to a regular fixed amount of dividend until maturity. However, they differ from regular shareholders as the payment of shareholders with preferred shares is done on a priority basis. It would mean that the shareholders with preferred stocks are considered first when the company distributes dividends or gets liquidated. 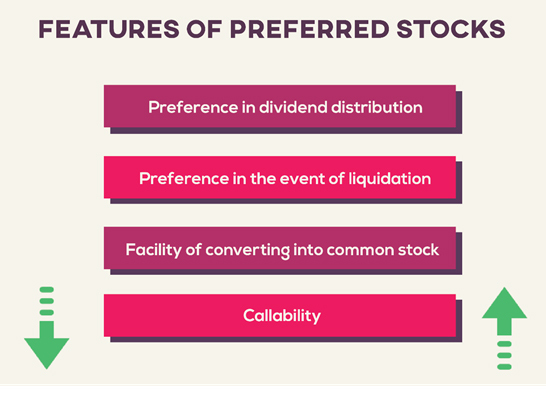 Preferred shares are generally considered as a type of hybrid stock as they contain both the features of an equity and a debt stock. Based on certain conditions, preferred stocks can also be changed into common stocks anytime. These are called convertible preferred stocks and can be traded like any other share on the Indian stock market. Preference in dividend distribution: If the company has enough profits to distribute dividends, the shareholders with preferred stocks are considered on a priority. In the event of liquidation: If the company goes bankrupt, preferred shareholders are paid off first, then the common stockholders. Facility of converting into common stock: Under the convertible preferred stocks, the shareholder can change the preferred stocks into common shares at any time. Callability: If the company permits, the shareholders with preferred shares can redeem their shares before the maturity period. People buy preferred stocks because it is tough to get a good return on government bonds and other financial instruments like fixed deposits. As the investors are distributed dividend on a priority basis, it makes up for a good source of regular salary. When you buy common stocks of a company, you do not receive a dividend until after the creditors, bondholders, and the preferred shareholders have received their dividend. If the total yield or long-term gains are looked at, the avenue for yield is higher in preferred shares when compared to bonds and common stocks. Most preferred stocks are cumulative: if the company fails to pay a dividend, the dividend amount is added to the next payout, and the company has to pay the total cumulated account the next time. This allows a shareholder to gain a high yield on his/her investments over a long period as the payment of dividend will be done in any case, i.e. if not now, then later. If you are looking for a financial product that can provide you with risk-free and regular dividend payments, you can consider buying preferred shares. Keep in mind that only a handful of good companies in India provide preferred shares. It is highly recommended that you consult your stockbroker before investing in preferred shares of a company.